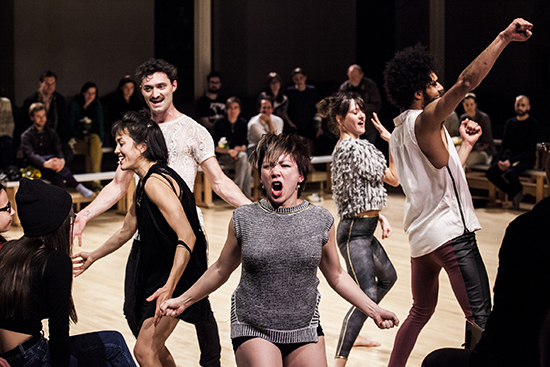 American choreographer Faye Driscoll’s Thank You For Coming: Attendance is all about connection. Beginning with a series of relational activities among the six performers, it increasingly pleats and folds its audience, culminating in an all-encompassing maypole dance. This is quite an achievement, offering a utopian glimpse of people enjoying a sense of connection—a form of community through performance. As they enter, audience members are asked to take off coats, bags and shoes, prior to settling around a large, raised square. The dancers line up and then enter the square. They form a living tableau, an unruly string of bodies that slowly moves through a series of assemblages. Their shapes are fairly ordinary, a wonky arabesque here, a precarious lean there. They shove, grab, pull and push each other, all the while holding on or touching. The chain created by these linked bodies slowly rolls off one side of the square dais and through the audience. We watch spectators rise up to manage the oncoming mass. The dancers pause then return, rolling up the top layer of the raised dais before moving onto the other side of the square. These flows disrupt the stability of the audience, its sense of place made temporary. The dais is disassembled to reveal a series of underlying benches that are used to form seating banks around a now empty square. This is filled with a pastiche of interactions, accompanied by a musician singing names which are repeated by the performers who rhythmically jerk from pose to pose in a sequence of exaggerated greetings and responses. This is a pantomime of interaction, characterised by hyperbole and parody. As the musician moves through the long list of names, we perhaps recognise our own. The effect of this and other successive actions is to slowly bring the audience towards a sense of participation. The finale introduces a maypole around which most (but not all) of the audience circulate, skipping and following the performers. This active form of participation brings joy, reflected in bodies and faces, as individuals are absorbed into the group. Thank You For Coming is an ontological piece aiming to create a mode of social being through performance. The intention to enact its vision shows a commitment to making a kind of political reality, one which is able to leave a trace in the bodies of the audience beyond participation through mere spectatorship. This is admirable. My reservations are ethical and aesthetic. From an ethical point of view, there was too much of the spectacular for my liking, including a strong dependence upon the fourth wall which the work as a whole purports to deconstruct. For example, in the first half, performers lurched into individual audience members, landing on their laps and peering into their faces, producing nervous smiles at best. People were given props to obediently wave. Some of us were also given ‘jobs.’ Mine was to hold a rope so as to make the maypole shape. Since the performers’ own interactions were marked by hyperbole, it was not surprising that these one-on-one interactions were not greatly nuanced. I was given my orders in a very bossy and urgent manner. Such momentary encounters nonetheless formed the basis of the work’s becoming-community. I had the feeling that the performers were throwing themselves fully into their task, but not taking a great deal of care how they did so, as if the process of making the work required less attention towards how they moved than to what they wanted to achieve. As a result, I felt that the work’s component sections were instrumentally devised towards result rather than process. The subtitle of this work is “attendance.” Can we attend to the body in new ways as we attend to each other, so that our work is not merely an instrumental good but transformative of the social corpus? 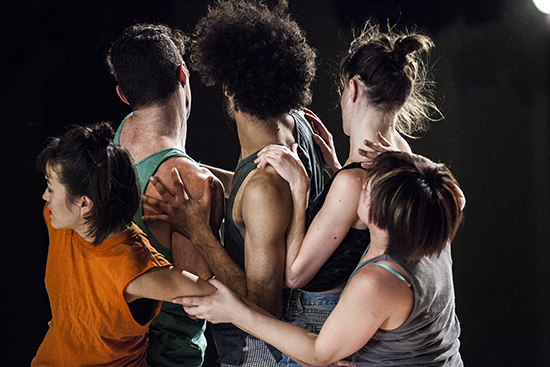 Watch an excerpt from a 2014 performance of Thank You For Coming: Attendance.